I have to be honest. I've wasn't a fan of Iron Man as kid. In fact, I was and still am a DC Comics guy. DC Comics has fared poorly with scripts, acting, and general non release of super hero films in their franchise. Batman is the only exception. On the other hand, Marvel Comics has released a film or subplot featuring just about every charcacter in their empire and done so very well with everything from Blade to Spiderman to X-men to Iron Man. That out of the way … the Iron Man franchise has made the transition from comics and cartoons very well to the movie screen. The majority of that success has to be attributed to Robert Downey Jr. - he is Iron Man. He almost has to ad lib a good bit of his lines. 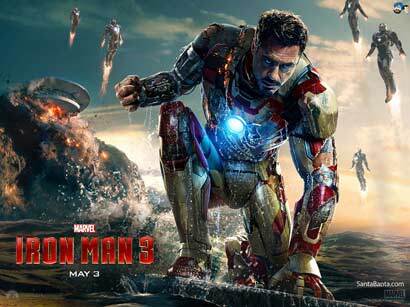 Downey's harsh, arrogant words become Tony Stark - the man behind Iron Man. I can almost picture Downey really being Iron Man if the technology and money permitted him. Downey was destined to be in the role. Iron Man III apparently begins to end Downey's run as Iron Man, but possibly hints at a smaller role in an Avengers sequel and maybe a spinoff. You'll have to see the movie to gather the same notion. The plot of the first Avengers movie is interwoven masterfully into the plot of the third Iron Man standalone movie. Downey portrays Tony Stark who is haunted by the images of "what happened in New York". This plot device plays nicely into the story because The Avengers movie was certainly on epic proportions and that sets the tone that this storyline can't possibly be as grandiose. Ben Kingsley as The Mandarin, the film's villain, is played terrifically. The Mandarin seems to be modeled somewhat after Osama Bin Laden. If you saw some of the previews and thought the Mandarin's voice to be cheesy, like I did, you'll understand that "voice" once you see the film. All the Iron Man movies get a five out five star rating from me. Perfect plots, seamless special effects, innovative action sequences, epic scale, and political incorrectness make the whole series of films a must see. All of the Iron Man movies are PG-13 for violence but none is gory or bloody (at least not blood by the gallons like some movies). The movie's characters rarely if ever curse and I can't recall hearing a single curse word - which is something rarely found in movies any more. This is certainly a family movie and your entire family will enjoy it. The only week spot, if one could be found, is Gwyneth Paltrow. Her acting is subpar in this film and the others.